Anyone can hike in summer, but off-season hiking in Oregon has buckets of rewards for the Gore-Tex-clad: Thinner crowds and fatter rivers, empty trailheads and outrageous waterfalls. Sure, there’ll be rain and puddles — so skip the picnic and plan your hike around a great meal afterward. Nothing gives you more genuine Oregon trail-cred than building up an appetite in our incredible outdoors, then bringing your wet self inside to quaff local wine or microbrews and devour a hot and hearty meal. Get out the rain gear and conquer these six trails in the Willamette Valley, then belly up to the bar (or table) to nosh away the cold and wet. 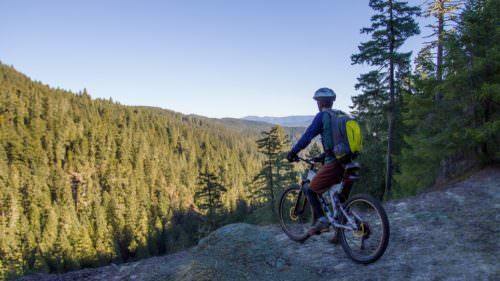 Roam 16 miles of trails at Willamette Mission State Park. 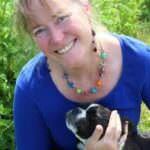 Hike: The flat and family-friendly trails crisscross orchards, meadows, woodlands and fields. The sculpted outlines of “ghost structures” hearken back to the mission founded here in 1834. Don’t miss the nation’s largest black cottonwood tree, 158 feet tall. 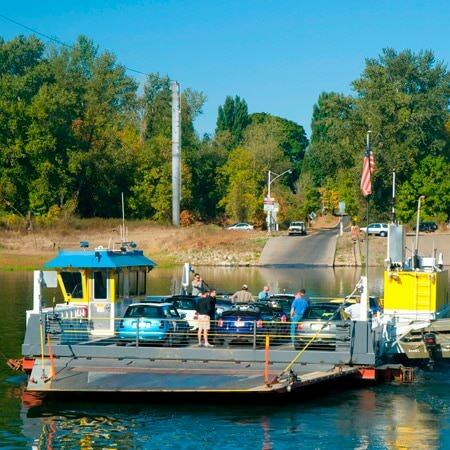 Take the Wheatland Ferry, one of three ferries crossing the Willamette today. Eat: Warm up at Gustav’s Bargarten in Keizer. The hearty German fare starts with cheese fondue and Bavarian pretzels. Main dishes include classics such as spätzle, sausages and schnitzel. Indulge in eggs Benedict over potato pancakes from the weekend brunch selection, and wash it all down with crisp German bier served in a glass boot. 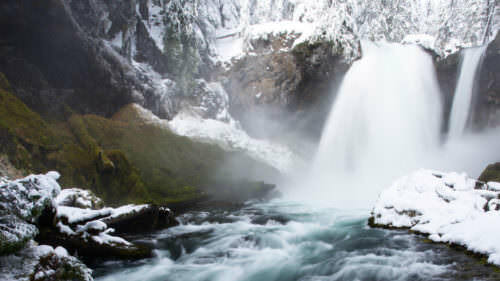 Wintertime works magic in Silver Falls State Park. Hike: Gigantic maple trees paint the woodlands in fiery hues every autumn here. Thanks to a spectacular accident of geology, you can marvel at several falls from behind the cascades. 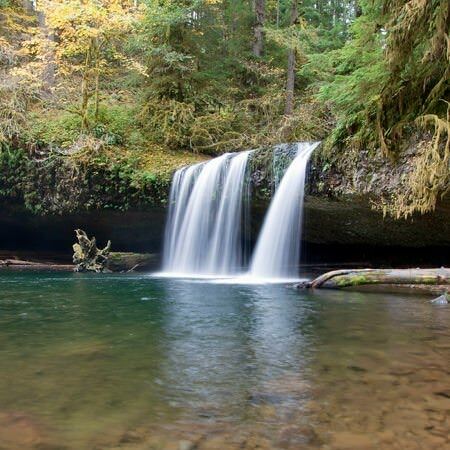 Walk the 4.5-mile Lower Loop Hike, visiting seven waterfalls including the magnificent two-tiered Double Falls. Eat: Enjoy sophisticated fare at the Silver Grille in Silverton. The bistro menu at this classic spot changes seasonally, and the kitchen handcrafts its own charcuterie, baguettes, ricotta and more. Mushroom bisque with white truffle foam and lamb bolognese appear on the chalkboard, along with a pear and elderflower highball. Save room for an exquisite jewel-like dessert. Trek along the August Mountain Loop. Hike: Much of this route traces dirt or gravel U.S. Forest Service roads, diminishing the puddle-and-mud factor. 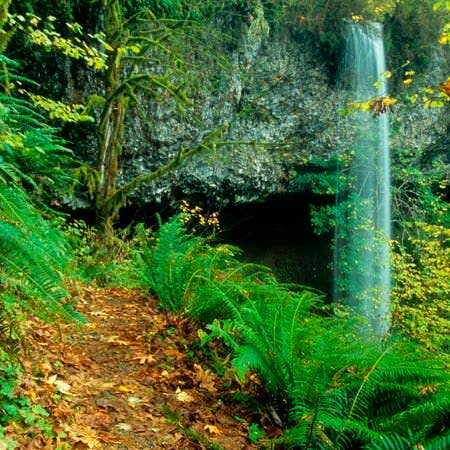 Two cataracts highlight the trail, which traverses a deep grotto for mesmerizing views from behind Shellburg Falls. Beautiful second-growth woods harbor trillium and fairy slipper orchids in springtime. Eat: Have a bite at Rosie’s Mountain Coffee House in Mill City. While most celebrated for their scones and cookies, Rosie’s has been fueling travelers along Highway 22 for more than a decade. Soups, sandwiches, smoothies and salads satisfy at this cozy counter-service cafe. Try the Gobbler: turkey, cream cheese and cranberry sauce on a croissant. They’re open early for your pre-hike latte and a breakfast sandwich. Wander in lush timberland on the Larison Creek Trail. Hike: A lovely brook runs through the old growth Douglas fir, western hemlock and vine maple that inhabit these trails. Look for a small waterfall plunging into a crystalline pool at the 3-mile mark. Horses and mountain bikes share this out-and-back track. Eat: Bring your appetite to Stewart’s 58 Drive-In in Oakridge. This 1960s-era burger joint is updated for contemporary tastes — chai or passion fruit milkshake, anyone? — but still true to its roots. Local, grass-fed beef burgers, Coney-style hot dogs and Paleo-friendly salads satiate hungry hikers. 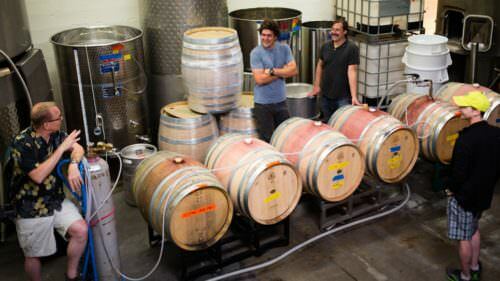 The owners make five relishes in-house, along with chili, soup and more. Grab espressos and breakfast burritos at their coffee drive-through, open early. 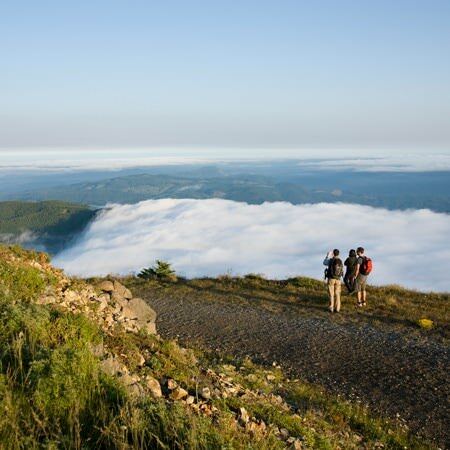 Ascend the 5,000-foot summit of Marys Peak. Hike: This gorgeous peak overlooks the Coast Range and the city of Corvallis, with clear-day panoramas of Mt. Jefferson, the ocean and even Mt. Rainier. Several paths thread the slopes — the East Ridge Trail winds 5.5 miles among noble fir, western red cedar and Douglas fir. A road ascends to the summit, where snow may dictate snowshoeing or cross-country skiing during winter months. Eat: Down-home BBQ in a 100-percent gluten-free kitchen lures legions to Eats and Treats Cafe in Philomath. Grilled and smoked meats compete with gluten-free chicken pot pie, mac-and-cheese, and sandwiches on house-made bread. The steakhouse salad tops greens, feta, red onions and tomatoes with sautéed tri-tip, and the desserts — especially the chocolate chip cookies — will send you smiling down the highway. 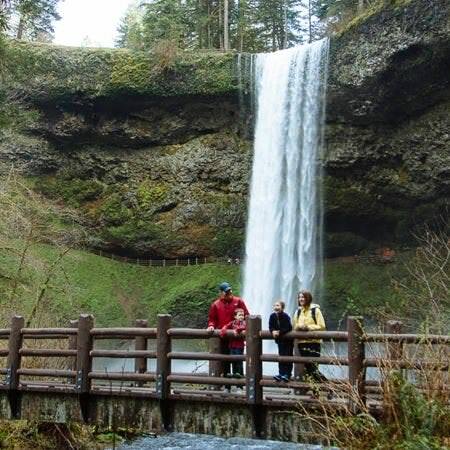 Soak up the beauty at Butte Creek Falls Loop Trail. 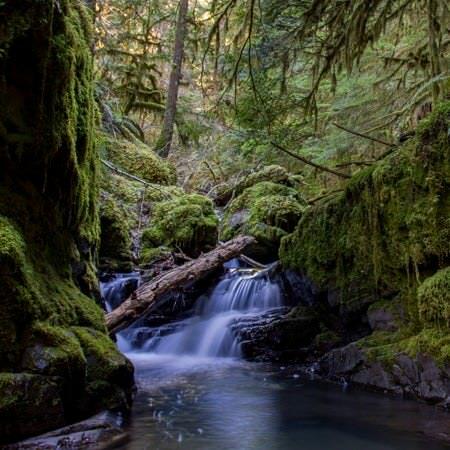 Hike: Located between Molalla and Silverton, this loop trail is just about a mile long but will get your heart rate up, as you ascend the semi-steep terrain toward two stunning falls. You’ll see the impressive sheet-like cascade of the lower falls right away; the 26-foot upper falls is a photo-worthy rest stop before the return. Eat: Fuel up with goodness after your hike with a warm quinoa and roasted root vegetable salad at Gather, a cozy farm-to-table bistro in downtown Silverton. The food here is lovingly sourced from the Willamette Valley, with hearty organic fare for both herbivores and carnivores. The chicken and waffles are divine; breakfast is served til noon on Saturday and all day on Sundays.